ready to use.Meanwhile, brush pita breads with oil and toast or grill; break into bite size pieces and place in a salad bowl, drizzle with 2 tsp. olive oil and a squeeze of lemon; season with salt and pepper. 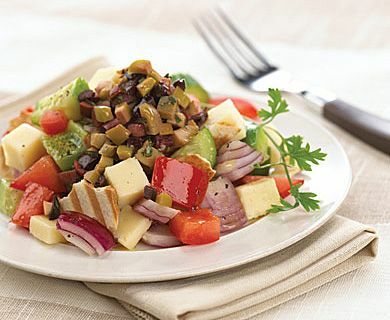 Add Havarti Cheese, green pepper, tomatoes, cucumber and red onion; add remaining olive oil and lemon and toss to combine. Place individual portions on salad plates and top with spoonfuls of salsa.